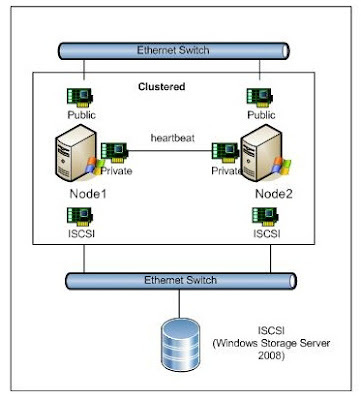 In this article, i am going to setup ISCSI target using Windows Storage Server 2008 as a "Storage Virtualization". As you may already know, Windows Storage Server 2008 is an OEM only product which comes preinstalled from the hardware vendor. To get this product, please refer to http://www.microsoft.com/windowsserver2008/en/us/wss08/partners.aspx or Technet subscriber can download for non production use. 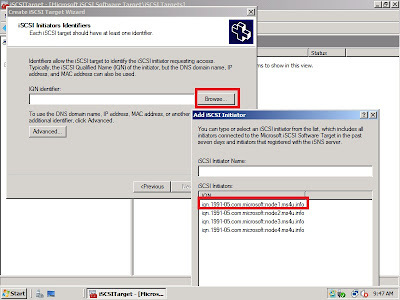 It is a good tool and enable you to simulate iscsi storage for virtualization high availability. a) Windows Storage Server 2008 - as storage virtualization. 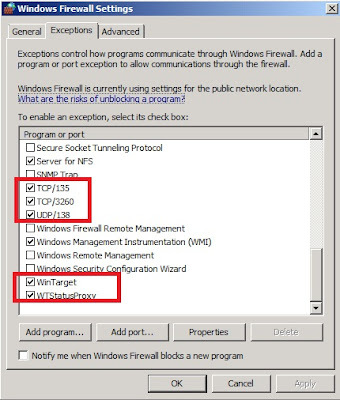 b) 2 nodes with Windows Server 2008 R2 with Hyper V roles installed. 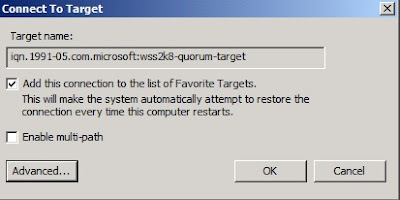 Default password for Windows Storage Server 2008 - "wSS2008!" 1. On Node1 and Node 2, add Target Portal. 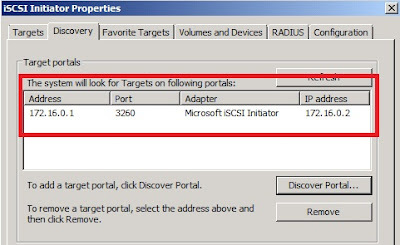 Using iSCSI Initiator Properties snap in, click on the Discovery tab and add your WSS2k8 ip address to the list of target portal. 3. 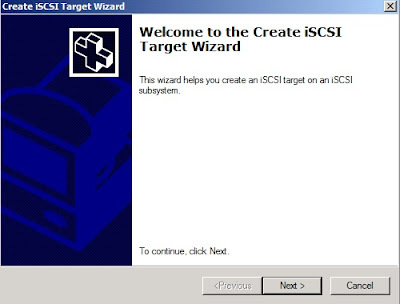 Create the iSCSI target. 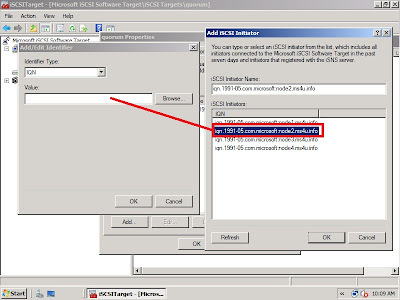 We will create the 2 target using Microsoft iSCSI software Targer MMC. b) A welcome page appear, click Next to proceed. 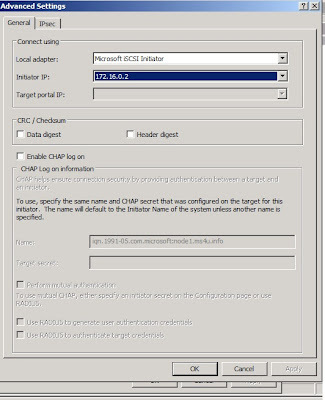 c) On the iSCSI Target identification, provide the iSCSI target name and description. 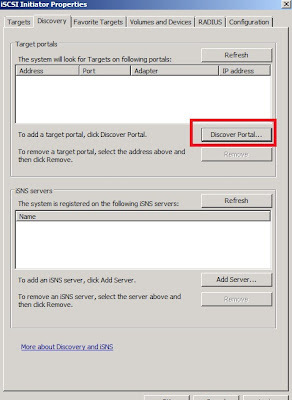 d) On the following screen, you need to provide the identifier for the iSCSI initiator request. 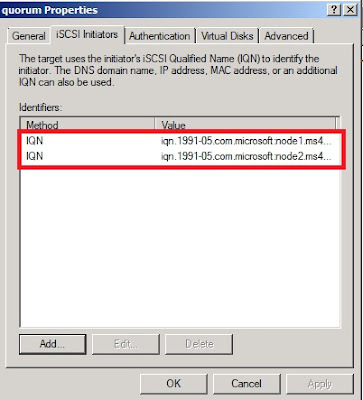 Click Browse and select Node1 IQN (iSCSI Qualified Name). e) Click Finish to complete the iSCSI Target wizard. 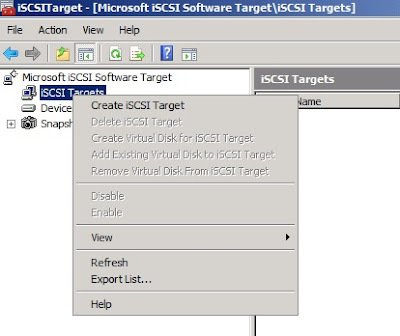 Repeat the same step to create VMDisk1 and VMDisk2 iSCSI target. 4. Add additional IQN (iSCSI Qualified Name) to iSCSI Target. Now we will add Node 2 IQN into iSCSI Target. 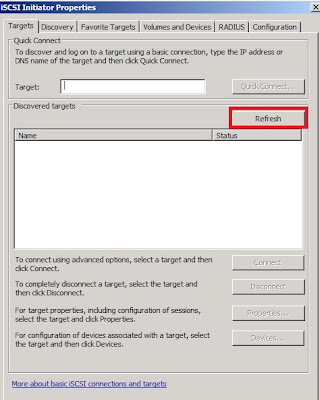 a) Right click the iSCSI target and select Properties. 5.Add Virtual Disk. 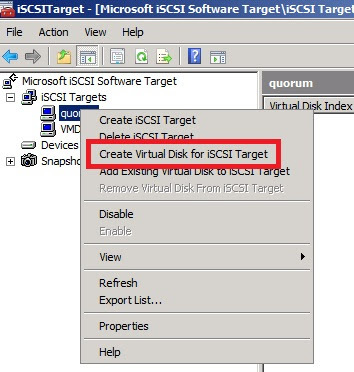 Next you need to create the virtual disk and assign to iSCSI Target. This is equivalent of creating a LUN in a SAN device. 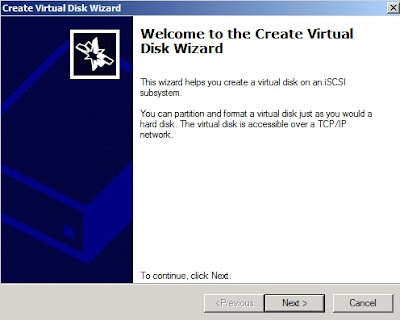 Virtual Disk created is in VHD extension and in fixed size format. 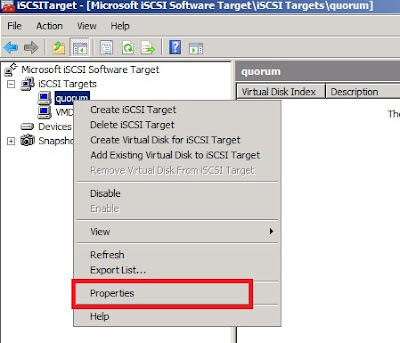 a) Right click the target quorum and select the option to Create Virtual Disks for iSCSI Target. b) A welcome to the create virtual disk wizard appear. c) Select the path and the name with VHD extension. d) Specify the size for the virtual disk. f) Finally click Finish to create the virtual disk. 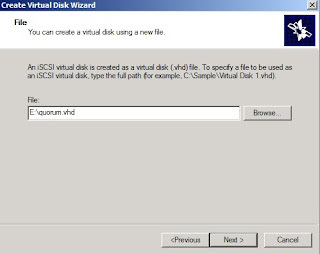 You can create multiple VHD files on the same disk. If multiple VHD is created on the same disk, you will encounter performance issue as these VHD will share the same I/O resources. Since you have finish configure the storage server, let move to Node1 and Node2. a) Click on Target tab and select Refresh. After a while, if the target properly configured, you should see it. c) Make sure "Add this connection to the ...." is tick. This ensure the connection is restore every time the computer is start. 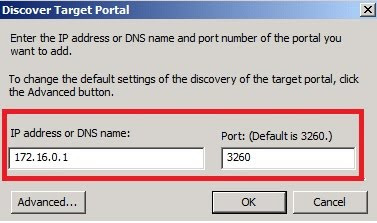 Target portal IP:- WSS2k8 ip address. Once you log on, the target status will change to "Connected"
Repeat the same step for all discovered targets. 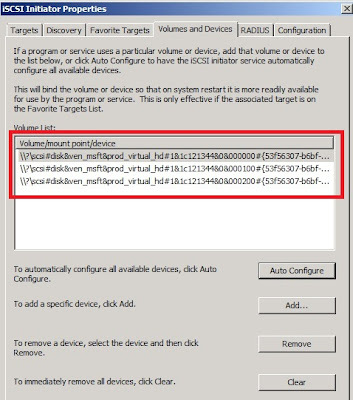 e) Go to Volume and Devices, click Autoconfigure button the see all the volume. The LUN should appear in the volume list. 7. Turn the LUN to NTFS volume. a) Go to Disk Management in Computer Management MMC. Initialize and format the LUN into NTFS volume. 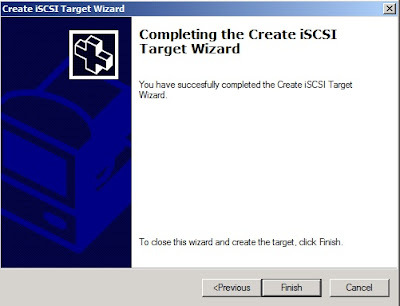 That's concluded on how to build an iscsi target using Windows Storage Server 2008. Very helpful, thank you for sharing. Did you create 3 separate targets with one disk on each target? Why not create one target with 3 disks? Just curious, still learning. Yes 3 separate target with 1 disk each. 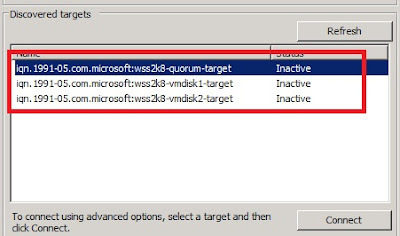 Minimum you need 2 target: quorum and LUN1 when you configure failover cluster and live migration using hyper V. Another target is for testing represent another LUN.